Today ABTV hosts @ThomasOrlina, @JenniferLeontv, and @makeup_mandi Denise got married! We talk little about Puppygate! The rest speaks for itself. Stay tuned for next episode! “The 50 shades of shade” In tonight’s episode 6 Mayte discusses the puppy gate drama, Teddi’s accountability and Camille’s 50 birthday. Join host Mayte and Cynthia as they chat about setting yourself and the truth free. Tonight AfterBuzz TV hosts @thomasorlina, @jleon.tv, @cynthianicole5 discuss episode two, season nine of Bravo’s The Real Housewives of Beverly Hills! This episode highlights the ladies getting ready for their trip to the Bahamas and the new dynamics between the new and old housewives. Watch and listen to our aftershow and make sure to follow all of us on social media to continue the conversation online. Don’t forget to comment and interact with us! AFTERBUZZ TV — The Real Housewives of Beverly Hills edition, is a weekly "after show" for fans of Bravo's The Real Housewives of Beverly Hills. In this episode hosts Richie Skye, Thomas Orlina, Grant Rutter, and Cynthia Nicole break down episode 21. AFTERBUZZ TV — The Real Housewives of Beverly Hills edition, is a weekly "after show" for fans of Bravo's The Real Housewives of Beverly Hills. In this episode hosts Thomas Orlina, Jenna Nicole, and Cynthia Nicole break down episode 20. AFTERBUZZ TV — The Real Housewives of Beverly Hills edition, is a weekly "after show" for fans of Bravo's The Real Housewives of Beverly Hills. In this episode hosts Jennifer Leon, Cynthia Nicole, and Lauren Spagnola break down episode 19 with Lindsey Pelas. AFTERBUZZ TV — The Real Housewives of Beverly Hills edition, is a weekly "after show" for fans of Bravo's The Real Housewives of Beverly Hills. In this episode hosts Richie Skye, Thomas Orlina, Jennifer Leon, and Cynthia Nicole break down episode 18. AFTERBUZZ TV — The Real Housewives of Beverly Hills edition, is a weekly "after show" for fans of Bravo's The Real Housewives of Beverly Hills. In this episode hosts Richie Skye, Thomas Orlina, Jennifer Nicole, and Cynthia Nicole break down episode 17. AFTERBUZZ TV — The Real Housewives of Beverly Hills edition, is a weekly "after show" for fans of Bravo's The Real Housewives of Beverly Hills. In this episode hosts Richie Skye, Thomas Orlina, Jennifer Leon, and Cynthia Nicole break down episode 16 with Matt Sarafa. AFTERBUZZ TV — The Real Housewives of Beverly Hills edition, is a weekly "after show" for fans of Bravo's The Real Housewives of Beverly Hills. In this episode hosts Richie Skye and Cynthia Nicole break down episode 15. AFTERBUZZ TV — The Real Housewives of Beverly Hills edition, is a weekly "after show" for fans of Bravo's The Real Housewives of Beverly Hills. In this episode hosts Richie Skye, Thomas Orlina, and Cynthia Nicole break down episode 14 with guest host Grant Rutter. AFTERBUZZ TV — The Real Housewives of Beverly Hills edition, is a weekly "after show" for fans of Bravo's The Real Housewives of Beverly Hills. In this episode hosts Richie Skye, Thomas Orlina, and Cynthia Nicole break down episode 13. AFTERBUZZ TV — The Real Housewives of Beverly Hills edition, is a weekly "after show" for fans of Bravo's The Real Housewives of Beverly Hills. In this episode hosts Richie Skye, Thomas Orlina, and Cynthia Nicole break down episode 12. AFTERBUZZ TV — The Real Housewives of Beverly Hills edition, is a weekly "after show" for fans of Bravo's The Real Housewives of Beverly Hills. In this episode hosts Richie Skye, Thomas Orlina, and Jennifer Leon break down episode 11. AFTERBUZZ TV — The Real Housewives of Beverly Hills edition, is a weekly "after show" for fans of Bravo's The Real Housewives of Beverly Hills. In this episode hosts Richie Skye, Thomas Orlina, Cynthia Nicole, and Jennifer Leon break down episode 10. AFTERBUZZ TV — The Real Housewives of Beverly Hills edition, is a weekly "after show" for fans of Bravo's The Real Housewives of Beverly Hills. In this episode hosts Thomas Orlina, Cynthia Nicole, and Jennifer Leon break down episode 9. AFTERBUZZ TV — The Real Housewives of Beverly Hills edition, is a weekly "after show" for fans of Bravo's The Real Housewives of Beverly Hills. In this episode hosts Richie Skye, Cynthia Nicole, and Jennifer Leon break down episode 8. AFTERBUZZ TV — The Real Housewives of Beverly Hills edition, is a weekly "after show" for fans of Bravo's The Real Housewives of Beverly Hills. In this episode hosts Cynthia Nicole, Lauren Spirit, and Jennifer Leon break down episode 7. AFTERBUZZ TV — The Real Housewives of Beverly Hills edition, is a weekly "after show" for fans of Bravo's The Real Housewives of Beverly Hills. In this episode hosts Richie Skye, Thomas Orlina, Cynthia Nicole, and Jennifer Leon break down episode 6. AFTERBUZZ TV — The Real Housewives of Beverly Hills edition, is a weekly "after show" for fans of Bravo's The Real Housewives of Beverly Hills. In this episode hosts Richie Skye, Thomas Orlina, Cynthia Nicole, and Jennifer Leon break down episodes 4 and 5. AFTERBUZZ TV — The Real Housewives of Beverly Hills edition, is a weekly "after show" for fans of Bravo's The Real Housewives of Beverly Hills. In this episode hosts Richie Skye, Thomas Orlina, Cynthia Nicole, and Jennifer Leon break down episodes 2 & 3. AFTERBUZZ TV — The Real Housewives of Beverly Hills edition, is a weekly "after show" for fans of Bravo's The Real Housewives of Beverly Hills. In this episode hosts Richie Skye, Thomas Orlina, and Jennifer Leon break down episode 1. AFTERBUZZ TV — The Real Housewives of Beverly Hills edition, is a weekly "after show" for fans of Bravo's The Real Housewives of Beverly Hills. In this episode hosts Grant Rutter, Megan Stecher, Thomas Orlina, and Jennifer Leon break down episode 21 of season 7 with special guest Eden Sassoon. AFTERBUZZ TV — The Real Housewives of Beverly Hills edition, is a weekly "after show" for fans of Bravo's The Real Housewives of Beverly Hills. In this episode hosts Grant Rutter, Megan Stecher, Jenna Nicole, and Chris Valentine break down episode 20 of season 7. AFTERBUZZ TV — The Real Housewives of Beverly Hills edition, is a weekly "after show" for fans of Bravo's The Real Housewives of Beverly Hills. In this episode hosts Grant Rutter, Jennifer Leon, Thomas Orlina, and Chris Valentine break down episode 19 of season 7. AFTERBUZZ TV — The Real Housewives of Beverly Hills edition, is a weekly "after show" for fans of Bravo's The Real Housewives of Beverly Hills. In this episode hosts Grant Rutter, Jennifer Leon, Thomas Orlina, and Chris Valentine break down episode 18 of season 7. AFTERBUZZ TV — The Real Housewives of Beverly Hills edition, is a weekly "after show" for fans of Bravo's The Real Housewives of Beverly Hills. In this episode hosts Grant Rutter, Megan Stecher, Chris Valentine, and Jennifer Leon break down episode 17 of season 7 with guest host Jill Simonian. AFTERBUZZ TV — The Real Housewives of Beverly Hills edition, is a weekly "after show" for fans of Bravo's The Real Housewives of Beverly Hills. In this episode hosts Grant Rutter, Chris Valentine, and Thomas Orlina break down episode 16 of season 7. AFTERBUZZ TV — The Real Housewives of Beverly Hills edition, is a weekly "after show" for fans of Bravo's The Real Housewives of Beverly Hills. In this episode hosts Grant Rutter, Chris Valentine, Jennifer Leon, and Christy Olson break down episode 15 of season 7. AFTERBUZZ TV — The Real Housewives of Beverly Hills edition, is a weekly "after show" for fans of Bravo's The Real Housewives of Beverly Hills. In this episode hosts Grant Rutter, Chris Valentine, Thomas Orlina, and Christy Olson break down episode 14 of season 7. AFTERBUZZ TV — The Real Housewives of Beverly Hills edition, is a weekly "after show" for fans of Bravo's The Real Housewives of Beverly Hills. In this episode hosts Grant Rutter, Jennifer Leon, Thomas Orlina, and Christy Olson break down episode 13 of season 7. AFTERBUZZ TV — The Real Housewives of Beverly Hills edition, is a weekly "after show" for fans of Bravo's The Real Housewives of Beverly Hills. In this episode hosts Grant Rutter, Chris Valentine, and Thomas Orlina break down episode 12 of season 7. AFTERBUZZ TV — The Real Housewives of Beverly Hills edition, is a weekly "after show" for fans of Bravo's The Real Housewives of Beverly Hills. In this episode hosts Grant Rutter, Chris Valentine, Thomas Orlina, and Jesse D'Angelo break down episode 11 of season 7. AFTERBUZZ TV — The Real Housewives of Beverly Hills edition, is a weekly "after show" for fans of Bravo's The Real Housewives of Beverly Hills. In this episode hosts Grant Rutter, Chris Valentine, Thomas Orlina, and Christy Olson break down episode 10 of season 7. AFTERBUZZ TV — The Real Housewives of Beverly Hills edition, is a weekly "after show" for fans of Bravo's The Real Housewives of Beverly Hills. In this episode hosts Grant Rutter, Chris Valentine, Thomas Orlina, and Christy Olson break down episode 9 of season 7 with special guest Eden Sassoon. AFTERBUZZ TV — The Real Housewives of Beverly Hills edition, is a weekly "after show" for fans of Bravo's The Real Housewives of Beverly Hills. In this episode hosts Grant Rutter, Megan Stecher, Thomas Orlina, and Christy Olson break down episode 8 of season 7. AFTERBUZZ TV — The Real Housewives of Beverly Hills edition, is a weekly "after show" for fans of Bravo's The Real Housewives of Beverly Hills. In this episode hosts Grant Rutter, Chris Valentine, Thomas Orlina, and Christy Olson break down episode 6 of season 7. AFTERBUZZ TV — The Real Housewives of Beverly Hills edition, is a weekly "after show" for fans of Bravo's The Real Housewives of Beverly Hills. In this episode hosts Grant Rutter, Chris Valentine, Thomas Orlina, and Christy Olson break down episode 5 of season 7. AFTERBUZZ TV — The Real Housewives of Beverly Hills edition, is a weekly "after show" for fans of Bravo's The Real Housewives of Beverly Hills. In this episode hosts Grant Rutter, Chris Valentine, Thomas Orlina, and Christy Olson break down episode 4 of season 7. AFTERBUZZ TV — The Real Housewives of Beverly Hills edition, is a weekly "after show" for fans of Bravo's The Real Housewives of Beverly Hills. In this episode hosts Grant Rutter, Megan Stecher, Thomas Orlina, and Christy Olson break down episode 3 of season 7. AFTERBUZZ TV — The Real Housewives of Beverly Hills edition, is a weekly "after show" for fans of Bravo's The Real Housewives of Beverly Hills. In this episode hosts Grant Rutter, Megan Stecher, Thomas Orlina, and Christy Olson break down episode 2 of season 7. AFTERBUZZ TV — The Real Housewives of Beverly Hills edition, is a weekly "after show" for fans of Bravo's The Real Housewives of Beverly Hills. In this episode hosts Grant Rutter, Thomas Orlina, Chris Valentine, and Christy Olson break down episode 1 of season 7. AFTERBUZZ TV — The Real Housewives of Beverly Hills edition, is a weekly "after show" for fans of Bravo's The Real Housewives of Beverly Hills. In this episode hosts Grant Rutter, Megan Stecher, Fern Ronay, and Christy Olson break down episode 23 of season 6. AFTERBUZZ TV — The Real Housewives of Beverly Hills edition, is a weekly "after show" for fans of Bravo's The Real Housewives of Beverly Hills. In this episode hosts Grant Rutter, Megan Stecher, Fern Ronay and Christy Olson break down episode 22 of season 6. AFTERBUZZ TV — The Real Housewives of Beverly Hills edition, is a weekly "after show" for fans of Bravo's The Real Housewives of Beverly Hills. In this episode hosts Grant Rutter, Megan Stecher, Fern Ronay and Christy Olson break down episode 21 of season 6. AFTERBUZZ TV — The Real Housewives of Beverly Hills edition, is a weekly "after show" for fans of Bravo's The Real Housewives of Beverly Hills. In this episode hosts Grant Rutter, Megan Stecher, Fern Ronay and Christy Olson break down episode 20 of season 6. AFTERBUZZ TV — The Real Housewives of Beverly Hills edition, is a weekly "after show" for fans of Bravo's The Real Housewives of Beverly Hills. In this episode hosts Grant Rutter, Megan Stecher, Fern Ronay and Christy Olson break down episode 19 of season 6. AFTERBUZZ TV — The Real Housewives of Beverly Hills edition, is a weekly "after show" for fans of Bravo's The Real Housewives of Beverly Hills. In this episode hosts Grant Rutter, Megan Stecher and Christy Olson break down episode 18 of season 6. AFTERBUZZ TV — The Real Housewives of Beverly Hills edition, is a weekly "after show" for fans of Bravo's The Real Housewives of Beverly Hills. In this episode hosts Fern Ronay, Grant Rutter, Megan Stecher and Christy Olson break down episode 17 of season 6. AFTERBUZZ TV — The Real Housewives of Beverly Hills edition, is a weekly "after show" for fans of Bravo's The Real Housewives of Beverly Hills. In this episode hosts Fern Ronay, Grant Rutter, and Christy Olson break down episode 16 of season 6. AFTERBUZZ TV — The Real Housewives of Beverly Hills edition, is a weekly "after show" for fans of Bravo's The Real Housewives of Beverly Hills. In this episode hosts Megan Stecher, Grant Rutter, Fern Ronay and Christy Olson break down episode 15 of season 6. AFTERBUZZ TV — The Real Housewives of Beverly Hills edition, is a weekly "after show" for fans of Bravo's The Real Housewives of Beverly Hills. In this episode hosts Grant Rutter and Christy Olson break down episode 14 of season 6. AFTERBUZZ TV — The Real Housewives of Beverly Hills edition, is a weekly "after show" for fans of Bravo's The Real Housewives of Beverly Hills. In this episode hosts Megan Stecher, Grant Rutter, Fern Ronay and Christy Olson break down episode 13 of season 6. AFTERBUZZ TV — The Real Housewives of Beverly Hills edition, is a weekly "after show" for fans of Bravo's The Real Housewives of Beverly Hills. In this episode hosts Megan Stecher, Grant Rutter, Fern Ronay and Christy Olson break down episode 12 of season 6. AFTERBUZZ TV — The Real Housewives of Beverly Hills edition, is a weekly "after show" for fans of Bravo's The Real Housewives of Beverly Hills. In this episode hosts Megan Stecher, Grant Rutter, Fern Ronay and Christy Olson break down episode 11 of season 6. AFTERBUZZ TV — The Real Housewives of Beverly Hills edition, is a weekly "after show" for fans of Bravo's The Real Housewives of Beverly Hills. In this episode hosts Megan Stecher, Grant Rutter, Fern Ronay and Christy Olson break down episode 10 of season 6. AFTERBUZZ TV — The Real Housewives of Beverly Hills edition, is a weekly "after show" for fans of Bravo's The Real Housewives of Beverly Hills. In this episode Grant Rutter, Dan Babic and Christy Olson break down episode 9 of season 6. AFTERBUZZ TV — The Real Housewives of Beverly Hills edition, is a weekly "after show" for fans of Bravo's The Real Housewives of Beverly Hills. In this episode hosts Megan Stecher, Grant Rutter, Fern Ronay and Christy Olson break down episode 8 of season 6. AFTERBUZZ TV — The Real Housewives of Beverly Hills edition, is a weekly "after show" for fans of Bravo's The Real Housewives of Beverly Hills. In this episode hosts Megan Stecher, Grant Rutter, Fern Ronay and Christy Olson break down episode 7 of season 6. AFTERBUZZ TV — The Real Housewives of Beverly Hills edition, is a weekly "after show" for fans of Bravo's The Real Housewives of Beverly Hills. In this episode hosts Fern Ronay, Grant Rutter, Megan Stecher and Christy Olson break down episode 6 of season 6. AFTERBUZZ TV — The Real Housewives of Beverly Hills edition, is a weekly "after show" for fans of Bravo's The Real Housewives of Beverly Hills. In this episode hosts Megan Stecher and Christy Olson break down episode 5 of season 6. AFTERBUZZ TV — The Real Housewives of Beverly Hills edition, is a weekly "after show" for fans of Bravo's The Real Housewives of Beverly Hills. In this episode hosts Christy Olsen, Megan Stecher and Fern Ronay break down episode 4 of season 6. AFTERBUZZ TV — The Real Housewives of Beverly Hills edition, is a weekly "after show" for fans of Bravo's The Real Housewives of Beverly Hills. In this episode hosts Christy Olsen, Megan Stecher, and Fern Ronay break down episode 3 of season 6. AFTERBUZZ TV — The Real Housewives of Beverly Hills edition, is a weekly "after show" for fans of Bravo's The Real Housewives of Beverly Hills. In this episode hosts Grant Rutter, Megan Stecher, Christy Olsen and Fern Ronay break down episode 2 of season 6. AFTERBUZZ TV — The Real Housewives of Beverly Hills edition, is a weekly "after show" for fans of Bravo's The Real Housewives of Beverly Hills. In this episode hosts Grant Rutter, Megan Stecher, and Fern Ronay break down episode 22 of season 6. AFTERBUZZ TV — The Real Housewives of Beverly Hills edition, is a weekly "after show" for fans of Bravo's The Real Housewives of Beverly Hills. In this episode hosts Grant Rutter, Megan Stecher, Fern Ronay, and Christy Olson break down episode 22 of season 6. AFTERBUZZ TV — The Real Housewives of Beverly Hills edition, is a weekly "after show" for fans of Bravo's The Real Housewives of Beverly Hills. In this episode hosts Grant Rutter, Megan Stecher, Fern Ronay, and Christy Olson break down episode 21 of season 6. AFTERBUZZ TV — The Real Housewives of Beverly Hills edition, is a weekly "after show" for fans of Bravo's The Real Housewives of Beverly Hills. In this episode hosts Grant Rutter, Megan Stecher, Paul Zahn, and Christy Olson break down episode 20 of season 6. AFTERBUZZ TV — The Real Housewives of Beverly Hills edition, is a weekly "after show" for fans of Bravo's The Real Housewives of Beverly Hills. In this episode hosts Grant Rutter, Fern Ronay, and Christy Olson break down episode 19 of season 6. AFTERBUZZ TV — The Real Housewives of Beverly Hills edition, is a weekly "after show" for fans of Bravo's The Real Housewives of Beverly Hills. In this episode hosts Megan Stecher, Fern Ronay, and Christy Olson break down episode 18 of season 6. AFTERBUZZ TV — The Real Housewives of Beverly Hills edition, is a weekly "after show" for fans of Bravo's The Real Housewives of Beverly Hills. In this episode hosts Megan Stecher, Grant Rutter, Fern Ronay, and Christy Olson break down episode 17 of season 6. AFTERBUZZ TV — The Real Housewives of Beverly Hills edition, is a weekly "after show" for fans of Bravo's The Real Housewives of Beverly Hills. In this episode hosts Grant Rutter, Fern Ronay, and Christy Olson break down episode 16 of season 6. AFTERBUZZ TV — The Real Housewives of Beverly Hills edition, is a weekly "after show" for fans of Bravo's The Real Housewives of Beverly Hills. In this episode hosts Megan Stecher, Fern Ronay, Grant Rutter, and Christy Olson break down episode 15 of season 5. AFTERBUZZ TV — The Real Housewives of Beverly Hills edition, is a weekly "after show" for fans of Bravo's The Real Housewives of Beverly Hills. In this episode hosts Megan Stecher, Grant Rutter, Fern Ronay, and Christy Olson break down episode 14 of season 6. AFTERBUZZ TV — The Real Housewives of Beverly Hills edition, is a weekly "after show" for fans of Bravo's The Real Housewives of Beverly Hills. In this episode hosts Grant Rutter, Fern Ronay, and Christy Olson break down episode 13 of season 6. AFTERBUZZ TV — The Real Housewives of Beverly Hills edition, is a weekly "after show" for fans of Bravo's The Real Housewives of Beverly Hills. In this episode hosts Megan Stecher, Grant Rutter, Fern Ronay, and Christy Olson break down episode 12 of season 5. AFTERBUZZ TV — The Real Housewives of Beverly Hills edition, is a weekly "after show" for fans of Bravo's The Real Housewives of Beverly Hills. In this episode hosts Megan Stecher, Fern Ronay, Grant Rutter, and Christy Olson break down episode 11 of season 5. AFTERBUZZ TV — The Real Housewives of Beverly Hills edition, is a weekly "after show" for fans of Bravo's The Real Housewives of Beverly Hills. In this episode hosts Fern Ronay, Grant Rutter and Christy Olson break down episode 10 of season 5. AFTERBUZZ TV — The Real Housewives of Beverly Hills edition, is a weekly "after show" for fans of Bravo's The Real Housewives of Beverly Hills. In this episode hosts Megan Stecher, Grant Rutter and Fern Ronay break down episode 9 of season 5. AFTERBUZZ TV — The Real Housewives of Beverly Hills edition, is a weekly "after show" for fans of Bravo's The Real Housewives of Beverly Hills. In this episode hosts Grant Rutter, Megan Stecher, and Fern Ronay break down episode 8 of season 5. AFTERBUZZ TV — The Real Housewives of Beverly Hills edition, is a weekly "after show" for fans of Bravo's The Real Housewives of Beverly Hills. In this episode hosts Megan Stecher and Christy Olson break down episode 7 of season 5. AFTERBUZZ TV — The Real Housewives of Beverly Hills edition, is a weekly "after show" for fans of The Real Housewives of Beverly Hills. In this episode hosts Megan Stecher and Christy Olson break down Episode 6 of Season 5. AFTERBUZZ TV — The Real Housewives of Beverly Hills edition, is a weekly "after show" for fans of The Real Housewives of Beverly Hills. In this episode hosts Grant Rutter, Megan Stecher, and Fern Ronay w/ special guest Candace Smith break down Episode 5 of Season 5. AFTERBUZZ TV — The Real Housewives of Beverly Hills edition, is a weekly "after show" for fans of The Real Housewives of Beverly Hills. In this episode hosts Grant Rutter and Fern Ronay discuss episode 4. AFTERBUZZ TV — The Real Housewives of Beverly Hills edition, is a weekly "after show" for fans of The Real Housewives of Beverly Hills. In this episode hosts Grant Rutter, Megan Stecher, and Fern Ronay discuss episode 3. AFTERBUZZ TV — The Real Housewives of Beverly Hills edition, is a weekly "after show" for fans of The Real Housewives of Beverly Hills. In this episode hosts Grant Rutter and Megan Stecher discuss episode 2. The second California-based installment of the Bravo franchise follows six Beverly Hills Housewives as they shop, schmooze, bicker, and live the lives of the rich and famous. Stars include former child actress Kim and Kyle Richards, and Camille Grammer, Kelsey Grammer's estranged wife. AFTERBUZZ TV — The Real Housewives of Beverly Hills edition, is a weekly "after show" for fans of The Real Housewives of Beverly Hills. In this episode host Grant Rutter, Megan Stecher, and Fern Ronay discuss episode 1. The second California-based installment of the Bravo franchise follows six Beverly Hills Housewives as they shop, schmooze, bicker, and live the lives of the rich and famous. Stars include former child actress Kim and Kyle Richards, and Camille Grammer, Kelsey Grammer's estranged wife. AFTERBUZZ TV — The Real Housewives of Beverly Hills edition, is a weekly "after show" for fans of The Real Housewives of Beverly Hills. In this episode host Ashley Daniels breaks down the episode in which Conclusion. The Beverly Hills wives reunite. Included: The ladies discuss their problems with Lisa, and the husbands join the discussion. There to help Ashley are co-hosts Cassidy Gard, Charlotte Broadbent and Jill Anenberg. It's The Real Housewives of Beverly Hills' "Reunion Part 3″ podcast! AFTERBUZZ TV — The Real Housewives of Beverly Hills edition, is a weekly "after show" for fans of The Real Housewives of Beverly Hills. In this episode host Ashley Daniels breaks down the episode in which the Beverly Hills housewives share laughter over their health and beauty regimens and shed tears talking about their children who are growing up and leaving home. Brandi delves into the tough year she's had, while Kim doesn't hide her conflicted feelings about Lisa. There to help Ashley are co-hosts Cassidy Gard, Charlotte Broadbent and Jill Anenberg. It's The Real Housewives of Beverly Hills' "Reunion Part 2″ podcast! AFTERBUZZ TV — The Real Housewives of Beverly Hills edition, is a weekly "after show" for fans of The Real Housewives of Beverly Hills. In this episode host Ashley Daniels breaks down the episode in which the gripping, three-part Beverly Hills reunion begins as Andy Cohen questions the women about the dramatic twists and turns of Season 4. Joyce and Brandi prove that there is no love lost between them, and the women explore what happened when the "dream team" of Yolanda, Lisa, and Brandi started to show its cracks. There are light moments as well, as Kim discusses her favorite season yet. There to help Ashley are co-hosts Cassidy Gard and Jill Anenberg. It's The Real Housewives of Beverly Hills' "Reunion Part 1″ podcast! AFTERBUZZ TV — The Real Housewives of Beverly Hills edition, is a weekly "after show" for fans of The Real Housewives of Beverly Hills. In this episode host Ashley Daniels breaks down the episode in which the ladies attend a lavish bash at the Beverly Hilton hotel in the Season 4 finale. Also: Kim attempts to make amends with Ken; Kyle, Brandi and Yolanda try to make peace with Lisa. There to help Ashley are co-hosts Cassidy Gard and Charlotte Broadbent. It's The Real Housewives of Beverly Hills' "Are You My Friend?" podcast! AFTERBUZZ TV — The Real Housewives of Beverly Hills edition, is a weekly "after show" for fans of The Real Housewives of Beverly Hills. In this episode host Ashley Daniels breaks down the episode in which A trip to Puerto Rico closes with golf, shopping and, last but not least, the threat of arrest. Back in 90210, Brandi surprises her parents; Kim and Yolanda bid adieu to their college-departing daughters; and Lisa discusses her mysterious exit from Puerto Rico in the middle of the night. There to help Ashley are co-hosts Charlotte Broadbent, Jill Anenberg, and Cassidy Gard. It's The Real Housewives of Beverly Hills' "The Kids Are Alright" podcast! AFTERBUZZ TV — The Real Housewives of Beverly Hills edition, is a weekly "after show" for fans of The Real Housewives of Beverly Hills. In this episode host Ashley Daniels breaks down the episode in which all the ladies, except Carlton, head off for a vacation in Puerto Rico. The relaxation doesn't last long after Yolanda and Brandi confront Lisa about the doubts they have regarding their friendships. A battle royale erupts over dinner, and Lisa and Ken leave the table, calling it a sabotage attack. There to help Ashley are co-hosts Jill Anenberg and Charlotte Broadbent. It's The Real Housewives of Beverly Hills' "Lines In The Sand" podcast! AFTERBUZZ TV — The Real Housewives of Beverly Hills edition, is a weekly "after show" for fans of The Real Housewives of Beverly Hills. In this episode host Ashley Daniels breaks down the episode in which Kyle and Joyce don't invite Carlton on their trip; Brandi tries to avoid Lisa at Gigi's party; Carlton refuses a gift from Kyle; Kyle accidentally shares something with the group. There to help Ashley are co-hosts Jill Anenberg and Charlotte Broadbent. It's The Real Housewives of Beverly Hills' "Turning Down The Crown" podcast! AFTERBUZZ TV — The Real Housewives of Beverly Hills edition, is a weekly "after show" for fans of The Real Housewives of Beverly Hills. In this episode host Ashley Daniels breaks down the episode in which Carlton oversees a party for her husband's business, a party to which Kyle is no longer invited. Brandi confides in Kim and Kyle that she is having serious doubts about her friendship with Lisa. There to help Ashley are co-hosts Cassidy Gard, Jill Anenberg, and Charlotte Broadbent. Also joining the conversation is special guest Alexis Bellino! It's The Real Housewives of Beverly Hills' "Trail of Doubts" podcast! AFTERBUZZ TV — The Real Housewives of Beverly Hills edition, is a weekly "after show" for fans of The Real Housewives of Beverly Hills. In this episode host Ashley Daniels breaks down the episode in which Joyce confronts Carlton about potentially putting a spell on Joyce's husband — which Carlton vehemently denies. Lisa and Kyle plan a joint birthday party for their husbands, but the party devolves into drama when Carlton brings up the ways in which Kyle has offended her. There to help Ashley are co-hosts Cassidy Gard, Jill Anenberg, and Charlotte Broadbent. It's The Real Housewives of Beverly Hills' "The Birthday Witch" podcast! AFTERBUZZ TV -- The Real Housewives of Beverly Hills edition, is a weekly "after show" for fans of The Real Housewives of Beverly Hills. In this episode host Ashley Daniels breaks down the episode in which Carlton invites the ladies to her annual pool party; Kyle gives Carlton a necklace; Kim attends a Hollywood autograph show; Yolanda invites the ladies to her home. There to help Ashley are co-hosts Cassidy Gard, Jill Anenberg, Charlotte Broadbent. Also joining the conversation is special guest Carlton Gebbia. It's The Real Housewives of Beverly Hills' "The Curse of Carlton" podcast! AFTERBUZZ TV -- The Real Housewives of Beverly Hills edition, is a weekly "after show" for fans of The Real Housewives of Beverly Hills. In this episode host Ashley Daniels breaks down the episode in which Brandi takes Yolanda to her hometown of Sacramento, where she'll be reading from her book. Brandi is more concerned, however, with seeing her father, from whom she's been estranged for months. There to help Ashley are co-hosts Cassidy Gard and Jill Anenberg. It's The Real Housewives of Beverly Hills's "Tough Break" podcast! AFTERBUZZ TV -- The Real Housewives of Beverly Hills edition, is a weekly "after show" for fans of The Real Housewives of Beverly Hills. In this episode host Ashley Daniels breaks down the episode in which Kim throws a luau for her daughter; Kim accuses Lisa of missing her daughter's party; Joyce and Brandi try to settle their problems civilly. There to help Ashley are co-hosts Cassidy Gard, and Jill Anenberg. It's The Real Housewives of Beverly Hills's "Luaus and Lies" podcast! AFTERBUZZ TV -- The Real Housewives of Beverly Hills edition, is a weekly "after show" for fans of The Real Housewives of Beverly Hills. In this episode host Ashley Daniels breaks down the episode in which Kim welcomes her dog home from boot camp; Carlton gets a tattoo; Yolanda scolds Brandi for her behavior; Joyce and Brandi share the catwalk at Kyle's fashion show; Kyle raises money for charity. There to help Ashley are co-hosts Charlotte Broadbent, Cassidy Gard, and Jill Anenberg. It's The Real Housewives of Beverly Hills's "Catfight on the Catwalk" podcast! AFTERBUZZ TV -- Real Housewives of Beverly Hills edition, is a weekly "after show" for fans of Bravo's Real Housewives of Beverly Hills. In this show, host Cassidy Gard break down the episode in which Yolanda and David celebrate their anniversary; Kim rides in a racecar; Carlton shops with her mother-in-law; Brandi and Joyce avoid each other, until they're forced to come face-to-face. There to help Cassidy is co-host Charlotte Broadbent. It's Real Housewives of Beverly Hills' "Guess Who's Coming to Dinner?" podcast! AFTERBUZZ TV – Real Housewives of Beverly Hills edition, is a weekly “after show” for fans of Bravo’s Real Housewives of Beverly Hills. In this show, host Cassidy Gard break down the episode in which Kim sends her problem dog to boarding school; Yolanda causes the group to split into two; Brandi insults Joyce. There to help Cassidy is co-host Charlotte Broadbent. It’s Real Housewives of Beverly Hills’ "She Hears You, She Hears You Not” podcast! AFTERBUZZ TV – Real Housewives of Beverly Hills edition, is a weekly “after show” for fans of Bravo’s Real Housewives of Beverly Hills. In this show, host Cassidy Gard break down the episode in which the ladies' Palm Springs excursion continues with Brandi wanting Kyle and Yolanda to resolve their issues. Meanwhile, the women go on an aerial tramway; Kim and Carlton forge a bond over squirrels; and Brandi hears upsetting news. There to help Cassidy is co-host Charlotte Broadbent. It’s Real Housewives of Beverly Hills’ "Escape to B. Mountain” podcast! AFTERBUZZ TV – Real Housewives of Beverly Hills edition, is a weekly “after show” for fans of Bravo’s Real Housewives of Beverly Hills. In this show, host Ashley Daniels breaks down the episode in which the ladies head to Palm Springs, Cal. Among the dramas: Brandi reveals a secret; Brandi irks Joyce; a tipsy Brandi picks a fight with Kyle at a group dinner; and Carlton sheds light on a tattoo. There to help Ashley is co-host Cassidy Gard. It’s Real Housewives of Beverly Hills’ "Palm Springs Breakers” podcast! AFTERBUZZ TV – Real Housewives of Beverly Hills edition, is a weekly “after show” for fans of Bravo’s Real Housewives of Beverly Hills. In this show, host Ashley Daniels break down the episode in which Yolanda's mother and brother visit from Holland; Carlton takes her ailing cat to get acupuncture; Kim, Kyle and Kathy attend the high school graduation of Kim's daughter; Brandi reveals a secret about Carlton. There to help Ashley is co-host Cassidy Gard. It’s Real Housewives of Beverly Hills’ "Star of the Family” podcast! 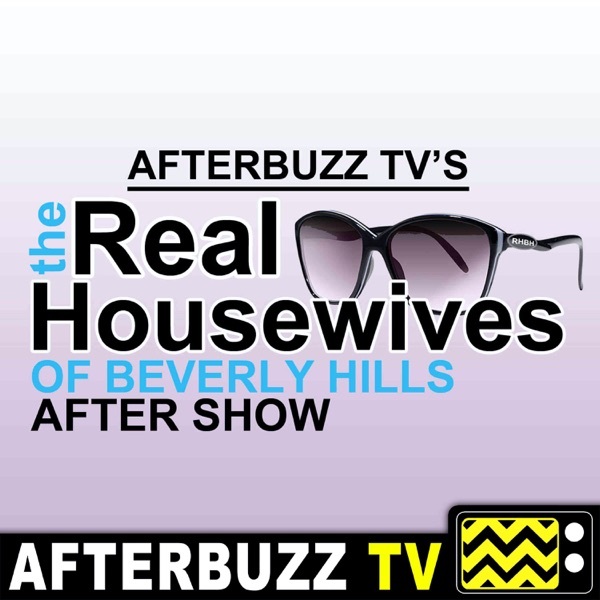 AFTERBUZZ TV – Real Housewives of Beverly Hills edition, is a weekly “after show” for fans of Bravo’s Real Housewives of Beverly Hills. In this show, host Ashley Daniels break down the episode in which Kim invites the ladies to a circus school in Hollywood; Brandi and Kyle battle it out; Joyce makes an accusation that baffles the ladies. There to help Ashley are co-hosts Grant Rutter and Cassidy Gard. Also joining the conversation is special call-in guest Carlton Gebbia (Housewife). It’s Real Housewives of Beverly Hills’ "Irked at Cirque” podcast! AFTERBUZZ TV – Real Housewives of Beverly Hills edition, is a weekly “after show” for fans of Bravo’s Real Housewives of Beverly Hills. In this show, host Ashley Daniels and Cassidy Gard break down the episode in which Carlton hosts a luncheon in her Gothic mansion, which comes complete with black cats and an eerie doll collection. Luncheon dramas include a late arrival, a discussion about witchcraft and tabloid accusations. It’s Real Housewives of Beverly Hills’ "Life's a Witch” podcast! AFTERBUZZ TV – Real Housewives of Beverly Hills edition, is a weekly “after show” for fans of Bravo’s Real Housewives of Beverly Hills. In this show, host Ashley Daniels breask down the episode in which Lisa gets support from the gang when she appears on TV's "Dancing With the Stars." Meanwhile, Yolanda prepares for a surgical procedure; Kyle organizes a lunch for new gal pals Joyce and Carlton; and Brandi's mother arrives. There to help Ashley are co-hosts Grant Rutter and Cassidy Gard. It’s Real Housewives of Beverly Hills’ "Faint Chance” podcast! AFTERBUZZ TV – Real Housewives of Beverly Hills edition, is a weekly “after show” for fans of Bravo’s Real Housewives of Beverly Hills. In this show, hosts Ashley Daniels, Grant Rutter, and Cassidy Gard break down the episode in which Season 4 opens with Kyle hosting a cocktail party and hiring Lisa's restaurant to cater the event. It’s Real Housewives of Beverly Hills’ "A Catered Affair to Remember ” podcast! AFTERBUZZ TV – Real Housewives of Beverly Hills edition, is a weekly “after show” for fans of Bravo’s Real Housewives of Beverly Hills. In this show, hosts Diona Vaughan, Giselle Ugarte, Susan Hahn, and Mari Fagel break down the episode in which the women discuss the season; Adrienne's absence sparks controversy; surprises are revealed. The ladies discuss the drama and relationships of the season. Also joining the conversation is special call-in guest Kevin Lee (Wedding Planner). It’s Real Housewives of Beverly Hills’ "Reunion Part 1 & 2” podcast! AFTERBUZZ TV – Real Housewives of Beverly Hills edition, is a weekly “after show” for fans of Bravo’s Real Housewives of Beverly Hills. In this show, hosts Giselle Ugarte, Susan Hahn, and Mari Fagel break down the episode in which Lisa prepares to renew her vows with Ken; Faye fights with Lisa. The women discuss the season; Adrienne's absence sparks controversy; surprises are revealed. It’s Real Housewives of Beverly Hills’ "Finale; Reunion Part One” podcast! AFTERBUZZ TV – Real Housewives of Beverly Hills edition, is a weekly “after show” for fans of Bravo’s Real Housewives of Beverly Hills. In this show, hosts Giselle Ugarte, Susan Hahn, and Mari Fagel break down the episode in which Adrienne's new vodka line launch party; Paul and Adrienne's separation. Also joining the conversation is special call-in guest Kevin Lee (Wedding Planner). It’s Real Housewives of Beverly Hills’ "A Shot Through the Heart” podcast! AFTERBUZZ TV – Real Housewives of Beverly Hills edition, is a weekly “after show” for fans of Bravo’s Real Housewives of Beverly Hills. In this show, hosts Diona Vaughan, Giselle Ugarte, and Mari Fagel break down the episode in which a Paris trip concludes with a boat ride on the Seine River, marked by a surprise connection between Kim and Brandi. A return to 90210 finds Lisa organizing her vow-renewal party with planner Kevin Lee. Also: Kyle prepares for her boutique launch; and Kim's erratic behavior is addressed. It’s Real Housewives of Beverly Hills’ "No Business Like Clothes Business” podcast! AFTERBUZZ TV – Real Housewives of Beverly Hills edition, is a weekly “after show” for fans of Bravo’s Real Housewives of Beverly Hills. In this show, hosts Giselle Ugarte, Susan Hahn, and Diona Vaughan break down the episode in which the women delight in their Paris trip, but dramas erupt when Kim arrives late to a cooking class. Later, Kyle confronts Lisa on top of the Eiffel Tower. It’s Real Housewives of Beverly Hills’ "The Real Housewives of Paris, Part Deux” podcast! AFTERBUZZ TV – Real Housewives of Beverly Hills edition, is a weekly “after show” for fans of Bravo’s Real Housewives of Beverly Hills. In this show, hosts Giselle Ugarte, Susan Hahn, Diona Vaughan, and Mari Fagel break down the episode in which Kim and Kyle confront Taylor about using alcohol; all of the women, except Taylor, take a trip to Paris; Kim acts oddly, which worries the ladies. It’s Real Housewives of Beverly Hills’s "The Real Housewives of Paris, Part Un” podcast! AFTERBUZZ TV – Real Housewives of Beverly Hills edition, is a weekly “after show” for fans of Bravo’s Real Housewives of Beverly Hills. In this show, hosts Susan Hahn and Mari Fagel break down the episode in which Kim reveals her new nose; Taylor doesn't attend Kim's party; Adrienne gets angry with Paul. It’s Real Housewives of Beverly Hills’s "White Party Pooper” podcast! AFTERBUZZ TV – Real Housewives of Beverly Hills edition, is a weekly “after show” for fans of Bravo’s Real Housewives of Beverly Hills. In this show, hosts Giselle Ugarte, Susan Hahn, Diona Vaughan, and Mari Fagel break down the episode in which Lisa and Kyle mend their friendship and put the past behind them. Lisa hosts a tea party which brings Brandi and Adrienne together for the first time since their incident at a previous party. It’s Real Housewives of Beverly Hills’s "Game of Scones” podcast! AFTERBUZZ TV – Real Housewives of Beverly Hills edition, is a weekly “after show” for fans of Bravo’s Real Housewives of Beverly Hills. In this show, host Diona Vaughan breaks down the episode in which while enjoying their time in Vegas, Brandi has the group try pole dancing. Later, Kim is under scrutiny for wanting to get a nose job and tensions rise as a feud is created while at the final dinner prior to departing Las Vegas. There to help Diona are co-hosts Giselle Ugarte, Susan Hahn, and Mari Fagel. It’s Real Housewives of Beverly Hills’s "Kim Nose Best” podcast! AFTERBUZZ TV – Real Housewives of Beverly Hills edition, is a weekly “after show” for fans of Bravo’s Real Housewives of Beverly Hills. In this show, host Diona Vaughan breaks down the episode in which Kyle's daughter graduates from sixth grade; Brandi and the ladies go to Vegas; at dinner, the women learn new things about each other. There to help Diona are co-hosts Susan Hahn and Mari Fagel. It’s Real Housewives of Beverly Hills’ "Stars and Stripes” podcast! AFTERBUZZ TV – Real Housewives of Beverly Hills edition, is a weekly “after show” for fans of Bravo’s Real Housewives of Beverly Hills. In this show, hosts Giselle Ugarte, Susan Hahn, Diona Vaughan, and Mari Fagel break down the episode in which Adrienne, Paul, Kyle and Mauricio discuss Brandi's actions; Yolanda decorates a mansion for her ex-husband; a psychic finds ghosts in Kim's home; Brandi invites the ladies to Las Vegas. It’s Real Housewives of Beverly Hills’s "Home Is Where the Art Is” podcast! AFTERBUZZ TV – Real Housewives of Beverly Hills edition, is a weekly “after show” for fans of Bravo’s Real Housewives of Beverly Hills. In this show, host Mari Fagel breaks down the season 2 final reunion show "Reunion Part3" in which the 90210 wives dish on season 2. There to help Mari are co-hosts Pamela Pekerman and former Project Runway model Jackie Miranne. It’s Real Housewives of Beverly Hills’ “Reunion Part 3” podcast!